I was going to follow up on yesterday's Rudy Tomjanovich mantra, "Never underestimate the heart of a champion," so I'll pay it a little lip service. CC Sabathia was brilliant and the Yankees needed all 9 innings from him in ALDS Game 5 to finally bury Baltimore. Then while we were enjoying an awesome Cajun meal at The Blind Tiger, the champs mounted their relentless comeback from 6-0 down, and the Cardinals shocked the Nationals 9-7. But I'm going to praise the heart of a TV road warrior instead, myself. Both stories from the Backtime Travelogue involve where I currently sit: Shreveport. 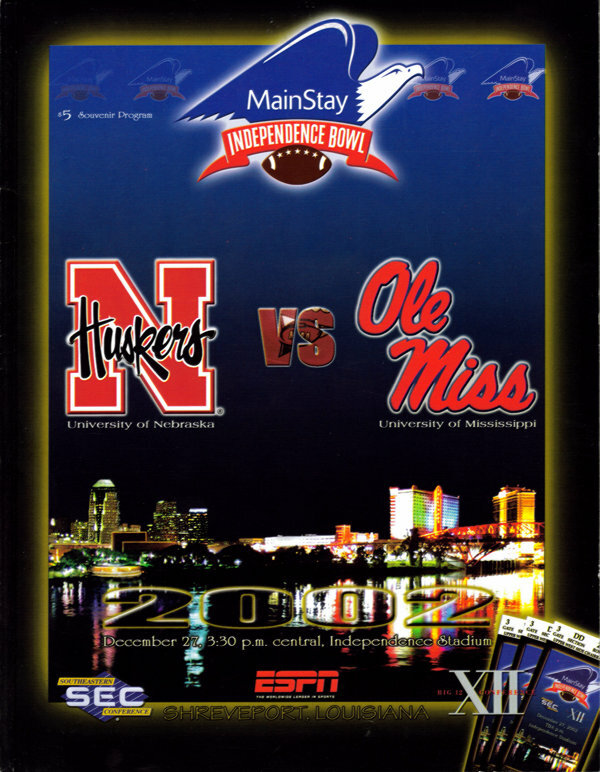 The Independence Bowl had always been a pretty pedestrian matchup between a SEC team and a Big 12 team. Sometimes, a classic breaks out like the 2000 Snow Bowl, when Mississippi State outlasted Texas A&M in the biggest snowstorm ever to hit Shreveport. The 2002 version was notable for a couple of reasons. First, the brand-name Nebraska Cornhuskers, who had played for the BCS Championship the season before, came in at 7-6. 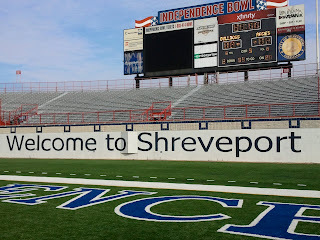 I had lived in Omaha for less than a year at the time, and was shocked that the Big Red-crazy city sent only one local TV news reporter to Shreveport. The season was already over and the second tier Bowl game was apparently invisible to even the nation's most die hard fans. Second, Ole Miss had a junior quarterback named Eli Manning. And we spent the 48 hours leading up to the game hunting down a rumor. Finally in the journalistic coup of my career, I discovered that Eli Manning was not in fact dating Britney Spears. The game was pretty good - Manning threw for 313 yards and the Rebels won 27-23. It was a good show, and an uneventful departure from Shreveport. Unlike the gamut I had ran nearly four years prior. It was in my mercenary (read: whore) period in the business, and I naturally committed to working 4 games in 4 days: 3 as a regional producer and one as a network associate director. We wrapped up our ho-hum hoop game in Boston College on Sunday (day 2), and I got to Logan on time for a flight to Memphis, expecting a connection to Monroe, Louisiana. The Monday game was a MLK Day women's matinee between perennial powers UConn and Louisiana Tech in Ruston. It was the national game that I graciously accepted (cha-ching), sandwiched between Boston and South Bend. I also graciously accepted long before I knew the Jets would be participants in the AFC Championship game. I was waiting my whole life for a Jet game of this magnitude, and I was hoping to catch the end of it on may layover in Memphis. But I had a more immediate problem. I had a 6 AM call time in Ruston, and the first flight into Monroe wouldn't get me in until 10:50 AM, barely 3 hours to tip-off. So I grabbed a rental car and started going. The weather had passed so I figured I'd make most of the 5+ hour drive that night, rack up somewhere along the way, and get to my gig. It sounded like a good plan. I set the cruise for about 75 MPH, and the drive from Memphis to Little Rock was a cakewalk. But southbound from Little Rock was a different deal. A two-lane highway, no street lights, and deer grazing along the side of the road in the middle of nowhere in the middle of the night. My grip is probably still indented on that rental's steering wheel. It was about 3 AM when I finally reached the outskirts of civilization, and laid head down on an Econo Lodge pillow in El Dorado, Arkansas for about 3 hours. Somehow I made it to Ruston within an hour of my call time, and while it was just another plot point on my 4-day odyssey, I was very happy to see some friends. 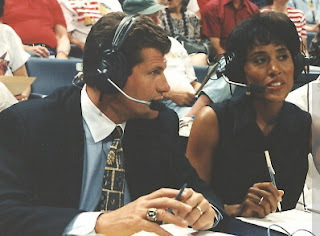 I had worked the previous year's 1998 WNBA season with Robin Roberts (play-by-play) and Geno Auriemma (analyst). They both figured in this game as well. Robin was broadcasting this game. It was always a pleasure working with her. She smiled more than any announcer I've ever worked with and her presence on any show added instant credibility. Both were great qualities to have, especially on an occasionally mundane product like women's basketball. "Oh my God! I can't see!" Geno saw me before I saw him. It was a resplendently sunny day and he was first off the UConn team bus. He was (and still is) the Huskies' head coach. His exclamation as he waved his hand over his eyes was a reaction to the glare coming off my bald head. I hadn't really slept, but my work on this day was as a mindless role player. We got on the air, had a 2-hour show, we got off the air. I hopped in the car and burned rubber for Shreveport Airport, where I would get a direct flight to Chicago, and then drive to South Bend. Except on the road from Ruston to Shreveport I ran out of gas. I never filled up on the ride through the night and I sputtered to an exit in Arcadia, LA. Fortunately the exit ramp was downhill. A truck driver gave me a lift about a half-mile to a Shell. I purchased a gallon of water, emptied it and filled it with regular. I borrowed a funnel from the filling station, and begged a quick ride back to the car. I returned to top the tank off, and got back on I-20. The whole ordeal took about an hour and the last flight to Chicago was presumably long gone. But when I got to Shreveport Airport, the Chicago flight was significantly delayed so I was still able to make it. The funny thing was it was a ground stop. The plane was on the runway, even though the jetway had been retracted. So I was escorted to the tarmac with my bags. The American commuter jet opened up their door, rolled down the stairs and I climbed onto the plane. This was pre-9/11, so while it was highly unusual it was possible. 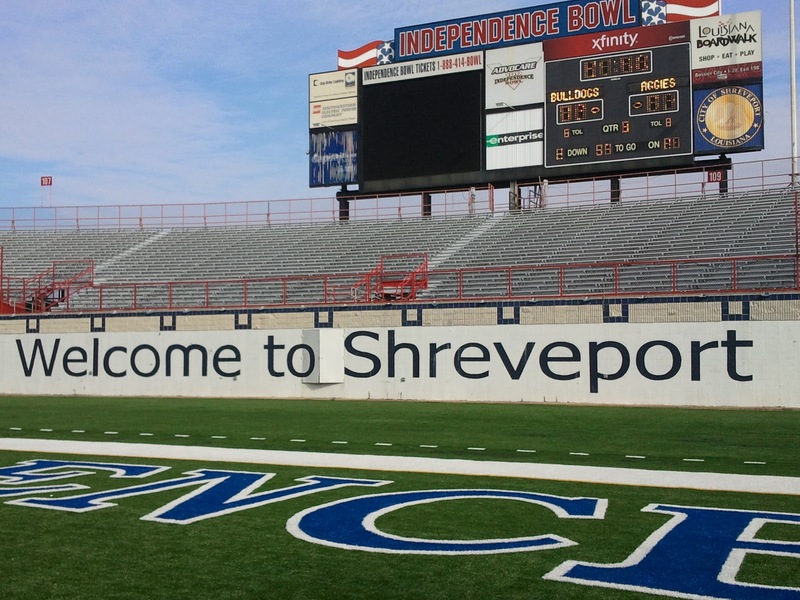 I felt very important - a Shreveport VIP - as I melted into my seat to grab a few minutes rest before I had to start studying for Seton Hall/Notre Dame. But that plane that was stuck on the runway would never leave for Chicago that day. After we were ultimately canceled, I walked across the terminal (inside this time) onto the Dallas flight and made the last connection to Chicago from there, where I finally landed after Midnight. It had been 70 degrees in Louisiana and it was under 10 in Chicago. I scraped the ice off my rental car windshield and ricocheted off to South Bend...a little too fast. About two miles out of O'Hare I saw the lights and sirens and got pulled over. I was almost happy as I got to tell the story of my day to the cop. I woke up in some roadside dump in Arkansas, I worked in Ruston, ran out of gas in Arcadia, got a flight canceled in Shreveport, and two flights later was now still 90+ minutes from South Bend. He said something along the lines of "That's quite a story" as though he was skeptical. I fished out my boarding pass and my Louisiana Tech credential. I realized at that point my fingers still smelled like gasoline but resisted the urge to have the police officer take a whiff. He gave me a warning and asked me to take it easy - at least until I crossed the Indiana line. I pulled up at the Marriott South Bend, after the time change around 4 AM. I got about 5 hours of sleep when the phone rang in my hotel room. It wasn't my wake up call. It was my network boss, offering his thanks for my efforts above and beyond what was required of me to get to Ruston. I could have told him what I did to get from Ruston to the landline in South Bend he was calling, but I simply told him it was no problem at all. It's all just part of the job.